Namotel Achhe Din is the latest phone in India that claims to cost under Rs. 100. Priced at Rs. 99, the Namotel Achhe Din could be the cheapest phone out there with a 4 inch colour touchscreen, Android, a quad core processor and 1 GB RAM. In fact, it could be the cheapest phone out there, period. However, it sounds too good to be true. Why? Because of the ludicrously low price. At Rs. 99, you don’t get a high quality screen guard these days – a phone costing less than a plastic screen guard is as ludicrous as it gets. So, what’s the catch? 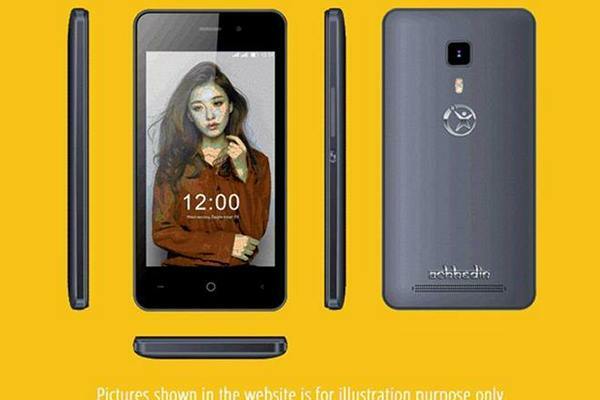 The company behind this phone, Namotel has sprung up out of nowhere. Hoping to ride on the media frenzy, Namotel – just like Ringing Bells Freedom 251 phone and Docoss X1 phone for Rs. 888. The modus operandi is very similar – announce a pre-order system for an extremely low cost phone running on Android. Additionally, by now, the company’s website is unreachable. Nothing about it inspires confidence. Namotel is claiming that its Achhe Din phone will come with a 4 inch display, a 1.3 GHz quad core processor and Android 5.1 Lollipop. The company is claiming that you can buy this phone at a price of Rs. 99. Regardless of what you think about the phone itself, it is an absolutely absurd price. As we have mentioned earlier, you can barely get a good quality screenguard for Rs. 99. Buying a phone for Rs. 99 is a fantasy, not reality. The first thing that strikes me about the Namotel Achhe Din is the name of the phone. Trying to ride on the popularity of the Prime Minister of India, Mr Modi, the Namotel Achhe Din goes a step further and appropriates Modi’s popular tagline of Achche Din. While the Namotel.in (and the .com domain as well) is down, we were able to grab a snapshot of the landing page of the company’s website. As you can see above, Namotel claims to be selling phones from Rs. 99 to 1,99,999. The fact that they have a Rs. 2 lakh phone that no one has heard about makes it all the more comical. And suspicious. While the website of the company is down, we had taken a look at the registration process for the Achhe Din phone. Apparently, Namotel wants you to register for the pre-order of Achhe Din on a website called BeMyBanker.com. Yes, that’s right – they want you to register for their phone on a different website that no one has heard about. Additionally, you would have to pay Rs. 200 for the registration and Rs. 99 for the phone. Shipping and Delivery costs extra. Apart from that, the company wants you to enter your Aadhaar card number as well. Nothing about the Namotel company inspires confidence. Right from the company’s website to the name – both of the company as well as the phone itself; the price of the phone; the portfolio that the company is showcasing on its website (now down); the registration process and the fact that they collect your Aadhaar registration details as well. One more thing that we have pointed out in the video below is that the people behind this company, one Mr. in particular, comes from the banking industry as a loan agent. The website’s WHOIS details suggest that the domain was registered a couple of months back and will expire in an year’s time. Run away as far as you can from this phoney company!